or click the add button at the bottom of the Presentations Library. 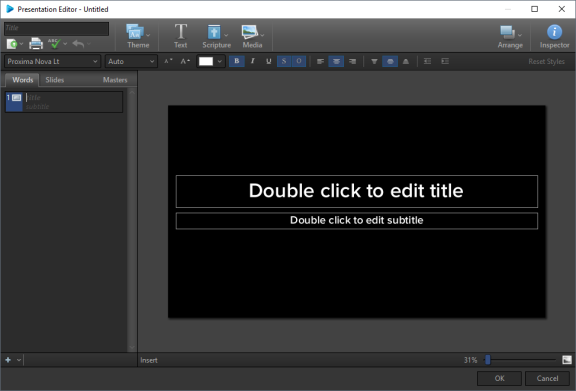 This opens the Presentation Editor window. 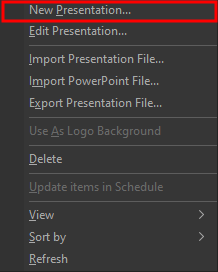 In the Schedule Area, select the presentation to be edited. The Schedule Editor window appears. The Words tab or Slides tab can be used to enter or edit text as needed. Use the toolbar to change the font and edit its style, size, and alignment. Use the heading buttons to select a Theme, create a new Text box, add a Scripture or Media element or Background, or Arrange Elements. Use the Inspector button to customize your presentation any way you want. Click the + (Add) icon in the bottom left corner to create a new slide or presee CTRL+ENTER, and then type the new slide text. Click OK when you are satisfied with the presentation. Right click and click duplicate slide. In the Resource Area, click on the Presentations tab. Select the presentation you wish to edit.